This catchy title caught my attention when checking out Netflix documentaries, which I selected and finally got around to viewing. What an eye-opener this film proved to be! I try to remain abreast of all developments related to creating sustainability, but I inadvertently failed to comprehend the full impact of livestock agriculture on global warming, which exceeds that of fossil-fuel use. Facts may be dully frustrating to ponder, but as a reflection of truth, they demand attention. There are many significant facts mentioned in the film and on the website, but a brief summary will suffice here. At the outset, it’s essential to realize that, when combining all costs associated with livestock agriculture—growing crops (planting, cultivating, fertilizing), transporting all related products, raising livestock and managing all waste products—the total effect can produce up to 51% of all worldwide greenhouse gas emissions. And it’s expected to increase to 80% by 2050! Moreover, livestock agriculture consumes 20-33% of the world’s fresh water, but up to 80-90% in the U.S. Other negative “collateral effects” of animal agriculture include the usurpation of worldwide land space (45%), the loss of carbon-sequestering woodlands, the proliferation of waste products, the creation of oceanic dead zones, the pollution of waterways, and the destruction of ecosystems and habitat, which inevitably leads to the loss of vital flora and fauna species. Are these enough reasons to gain your attention and concern? Please view the trailer (http://www.cowspiracy.com) for a brief introduction to the film. And then view the entire film, which is available on Netflix streaming. Also, there are several agriculture-related articles worth reading (in Views): “The Problem of Agriculture” (Jenson); “Our Food System Is Broken” (Greenpeace staff); and “The Complex Nature of GMOs” (Ensia). Note: Next newsletter—Nov. 11th. We’ll be expanding our ecological footprints in Europe. > Resilience: The Problem Of Agriculture (Robert Jensen). While gathering-hunting humans were capable of damaging a local ecosystem in limited ways, the shift to agriculture and the domestication of animals meant humans for the first time could dramatically alter ecosystems, typically with negative consequences. Agriculture’s destructive capacity was ramped up by the industrial revolution that began in the last half of the 18th century in Great Britain, which intensified the magnitude of the human assault on ecosystems. The assumed “advances” in oil/gas-based industrial agriculture have accelerated ecological destruction. Natural systems agriculture is one attempt to produce enough food while adding to ecological capital rather than degrading it. > Greenpeace: Problem: Our Food System Is Broken (Staff). A greedy elite are industrializing, commodifying and controlling every aspect of our food system — from genome to grocery store. They are growing our food on huge monoculture farms, spraying genetically modified crops with obscene amounts of chemicals and feeding these crops to factory-farmed animals. > Ensia: The Complex Nature Of GMOs Calls For A New Conversation (Maywa Montenegro). The author is a proponent of agroecology, food sovereignty, and the rights of farmers to save and reproduce their seed, but she is not anti-GMO. With other colleagues, she believes that some GM crops could have some benefits. What she objects to is a lack of complex evaluations of the technology, the overzealous selling of its benefits and the framing of cautionary skeptics as anti-science scaremongers. Though there are many angles from which to look at this issue, three are particularly important to help us get past less consequential aspects of this technology and on to things that are having a greater impact: 1) the construction of scientific consensus around GMO safety; 2) the framing of biotech benefits, which are often exaggerated; and 3) the debate about the increasingly murky waters of scientist-industry-media relations. > CASSE-The Daly News: Setting Things Straight For The Steady State (Brian Czech). The forthcoming A Future Beyond Growth (Routledge, 2016), edited by Haydn Washington and Paul Twomey, explores the vision and process for moving toward a steady state economy. The fundament conflict between economic growth and environmental protection stems from the first two laws of thermodynamics: Law 1) You can’t get something from nothing; Law 2) You can’t be 100% efficient in the production process. These laws set up a limit to economic growth, as well as the fundamental conflict between economic growth and environmental protection, as evidenced most clearly by the erosion of biodiversity in lockstep with economic growth. Economic growth should be distinguished from “economic development,” which refers to qualitative change regardless of quantitative growth. > Resilience: Richard Heinberg Talks About Afterburn (Hal Ginsberg, Richard Heinberg). After a two-century-long burning bender, the globe is in for a heck of a hangover. > Democracy Now: This Changes Everything: Naomi Klein & Avi Lewis (Video & Transcript). Naomi Klein, journalist and best-selling author. Her most recent book is This Changes Everything: Capitalism vs. the Climate. She narrates the documentary film based on the book. Avi Lewis, director and producer of the documentary film, This Changes Everything. He was previously a host for the Al Jazeera show Fault Lines. > Peak Prosperity: How Much Longer Can Our Unaffordable Housing Last? (Charles Hughes Smith). Markets discover price via supply and demand: Big demand + limited supply = rising prices. Abundant supply + sagging demand = declining prices. The globalization of regional housing markets is pricing the middle class out of housing in areas that also happen to be strong job markets. Many commentators are concerned that a nation of homeowners is being transformed into a nation of renters, as housing is snapped up by hedge funds and wealthy elites fleeing China and the emerging markets. > The Archdruid Report: A Landscape Of Dreams (John Michael Greer). One of the core themes of the Retrotopia narrative I’ve been developing here over the last month or so is the yawning gap between the abstract notion of progress that we all have in our heads and the rather less pleasant realities to which this notion has been assigned. The current U.S. political system is so deeply entrenched in its own fantasies that a complete breakdown of that system, and its replacement by something entirely different—not necessarily better, mind you, but different—is a possibility that has to be kept in mind even in the near term. > Civil Eats-Resilience: U.S. Farms Becoming Less Diverse Over Time (Jennifer Baimer). A new study published last month in the journal PLOS ONE, shows that U.S. crop diversity is significantly lower today than it was 30 years ago. So while it’s been a commonly held belief that U.S. farms are moving toward monoculture, and away from crop diversity, now there’s solid evidence to support that claim. A continued trend towards a less diverse and more homogenous agricultural system could have far-reaching consequences for food-system sustainability. 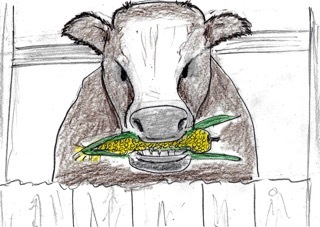 Consuming conventionally farmed animal products such as meat and dairy, for instance, contributes less to diversity than fruits and vegetables since much of the corn and soy grown in the U.S. goes to feed animals. > Eco Watch-Alternet: Honeybees Face Global Threat: If They Die, So Do We (Reynard Loki). Starting around 11,500 years ago, when humans began making permanent settlements and invented agriculture, bees emerged as the most critical animal to human survival. By pollinating crops around the world, honeybees feed more than 7 billion people today. Most of the food that we eat (and all of our cotton) is produced in part by the hard work of bees. Sadly, in recent times, we have not treated our bee friends well. The use of pesticides—neonicotinoids in particular, which are commonly used on corn, soybean, canola and cereal, as well as many fruits and vegetables—have killed an estimated 250 million bees in a just a few years. > Circle of Blue: While South Carolina Floods, U.S. Wrestles With Urban Stormwater (Codi Kozacek). The bruising deluge, which South Carolina Governor Nikki Haley called a once-in-a-millennium event, focuses attention on the most persistent and troubling water pollution problem in the country—water that rushes off cities, suburbs, and farmland that carries pollutants into the nation’s waters. The South Carolina floods, moreover, come as the U.S. Environmental Protection Agency is preparing to propose new rules tightening stormwater oversight in small towns and cities across the country. > IFL Science: The Oceans Are Becoming Too Hot For Coral, And Sooner Than We Expected (Ove Hoegh-Guldberg). This week, scientists registered their concern that super-warm conditions are building to a point where corals are severely threatened across the tropical Indian, Pacific and Atlantic oceans, reportedly the third global bleaching event in recorded history. Over the past 12 months, the temperatures of the upper layers of the ocean have been running unseasonably warm. Underwater heat waves have torn through these tropical regions over summer, and corals across large areas of reef have lost their color as the algal partners (or symbionts) that provide much of the food for corals have left their tissues. Bereft, corals are beginning to starve, get diseased and die. At one level, the drivers for the current global bleaching event are clear: climate change. > Washington Post: New Studies Deepen Concerns About A Climate-Change ‘Wild Card’ (Joby Warrick). Two new studies are adding to concerns about the possibility that global warming could slow or shut down the Atlantic’s great ocean circulation systems, with dramatic implications for North America and Europe. > Huffington Post: Welcome To A New Planet (Michael Klare). 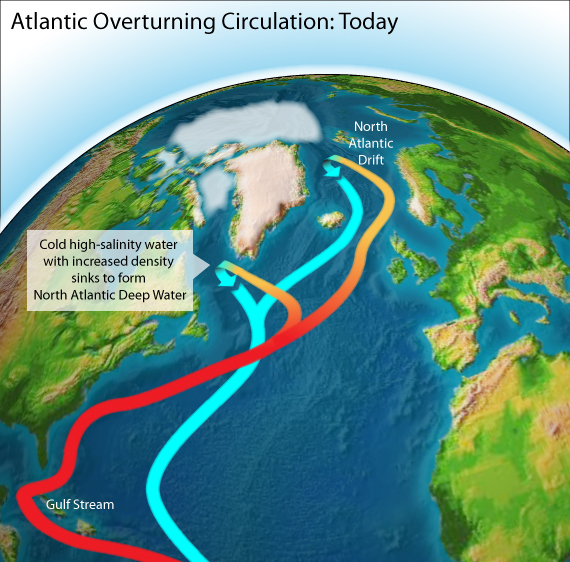 So long as the “global conveyor belt” — known to scientists as the Atlantic Meridional Overturning Circulation, or AMOC — keeps functioning, the Gulf Stream will also continue to bring warmer waters to the eastern United States and Europe. Should it be disrupted, however, the whole system might break down, in which case the Euro-Atlantic climate could turn colder and more storm-prone. In a 2014 report, “Impacts, Adaptation, and Vulnerability,” Working Group II of the IPCC identified three other natural systems already showing early-warning signs of catastrophic tipping points: the Arctic, coral reefs, and the Amazonian forest. All three, the report suggested, could experience massive and irreversible changes with profound implications for human societies. > Vox-Energy & Environment: We’re Flushing All These Antidepressants Into Our Water. How Big Is The Problem? (Elizabeth Grossman). With use of pharmaceuticals growing worldwide, it’s no surprise that we’re finding more and more of them in the environment. But increased usage is not the only reason detection is on the rise. As increasingly sophisticated environmental testing methods have become available in recent years, what have come to be called micro-pollutants and emerging contaminants — a category that includes pharmaceuticals — have started to be detected with greater precision. > Reneweconomy: TPP Agreement Slammed As ‘Betrayal’ Of Environment, Boon For Fossil Fuels (Sophia Vorrath). Social media sites were peppered with criticism, on Tuesday, describing the preliminary agreement between trade ministers from 12 countries as a “pathetic betrayal” of the environment, a prioritization of corporate investment over nature, a ticking time bomb for climate policy, and an all-round bad deal. For its part, the White House is chalking the deal up as a triumphant success, touting, in particular, its potential for environmental conservation as a “once-in-a-generation chance to protect our oceans, wildlife, and the environment.” But this has been called out as green-wash by some, and labeled pathetic by others, including US environmental activist and author Naomi Klein. > The Corbett Report: The Trans-Pacific Partnership Negotiations Are Finished: Here’s What You Need To Know (James Corbett). Who wins? In a word: business. No, not mom-and-pop, corner-store business, but big multinational corporate business. Who loses? Pretty much everyone else which explains why only a truly bad deal could bring together such a disparate bunch as Hillary Clinton, Mike Huckabee, Noam Chomsky, and a host of others of left and right persuasions. > 100pct-Sierra Club: Why Urban Trees Solve So Many Of Our Problems (Catherine Schuknecht). Trees cover an estimated 20.9 million acres of urban land in the continental United States. That’s 3,659 square feet of urban forest per city dweller—about the size of a not-so-modest four-bedroom house. Urban forests can basically fix a lot of our problems, but only if everyone has equal access to the social, economic, and health advantages of a little extra tree cover. > Ag Weekly: USDA To Invest $4 Million For Honey Bee Food Sources On Private Lands National Resources Conservation Service (NRCS) is working with landowners in Michigan, Minnesota, Montana, North Dakota, South Dakota and Wisconsin to make bee-friendly conservation improvements to their land, such as planting cover crops, wildflowers or native grasses and improving management of grazing lands. From June to September this six-state region is home to more than 70 percent of the commercially managed honeybees in the country. These are critical months when bee colonies need abundant and diverse forage to store enough food for winter. > Transition Network: Practical Projects (Mike Thomas). Practical projects show that change is possible and that Transition is a real thing that exists. They can be creative, great fun, an opportunity to learn new skills and great for making new friends. There are no right or wrong Transition projects. It is all about what feels right for your group to do in your community. Practical projects are great for getting Transition going and for embedding it in the local community. > The Carbon Pilgrim: An Unprecedented Future (Courtney White). I’ve come up with five principles (small p) for living in the Age of Consequences that I’d like to share: 1) Stop living in denial. The previous era is over and gone. We live now in a period of transition between what was and what will be; 2) Believe that solutions exist; 3) Explore and share; 4) Focus on the little normal; and 5) Don’t despair. > Climate Progress: This Tiny Country Is Going 100 Percent Organic (Natasha Geiling). In 2011, the tiny mountain nation of Bhutan (700,000 citizens) announced a lofty goal: make the country’s agricultural system 100% organic by 2020. If it succeeds, it will be the first country in the world to achieve this feat. Bhutan is the only country in the world that rejects gross domestic product (GDP) as a measure of progress. Since 1971, the country has instead relied on a measurement known as gross domestic happiness — a benchmark that seeks to quantify the happiness and health of the entire country. For the United States to switch to 100% organic agriculture, it would require a massive overhaul of our priorities, at a federal, industrial, and consumer level. > Sierra Club: People’s Climate Gathering, Wed., Oct. 14, 6:00 to 9:00 p.m.
CWA Local 7200, 3521 E., Lake Street, Minneapolis, 55406 (map); Contact Karen Monahan. > Fresh Energy: Solar for All, Wed., Nov. 18, 7-9:30 am, Town and Country Club, St. Paul, MN; Breakfast included; Register here.